Bollywood newbie Sara Ali Khan is not just looks and unsurmountable charisma with ample star-power on-screen, as it is a fact widely known that the actor is a beauty with big brains. The actor re-exploring the Big Apple accompanied by girl gang as she frequently gives a sneak peek of her trip to her followers. 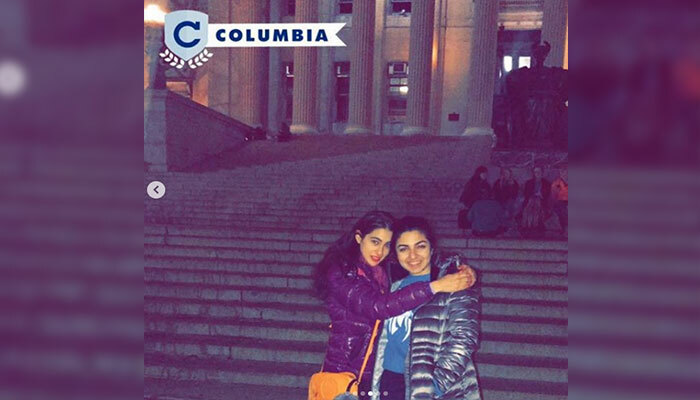 Having studied from an Ivy League school, the 23-year-old Kedarnath star on her visit to New York City has also paid a visit to her alma matter –Columbia University. Amongst the photos Sara shared on her Instagram, she also dropped a picture of herself at Columbia where she studied law and political science.